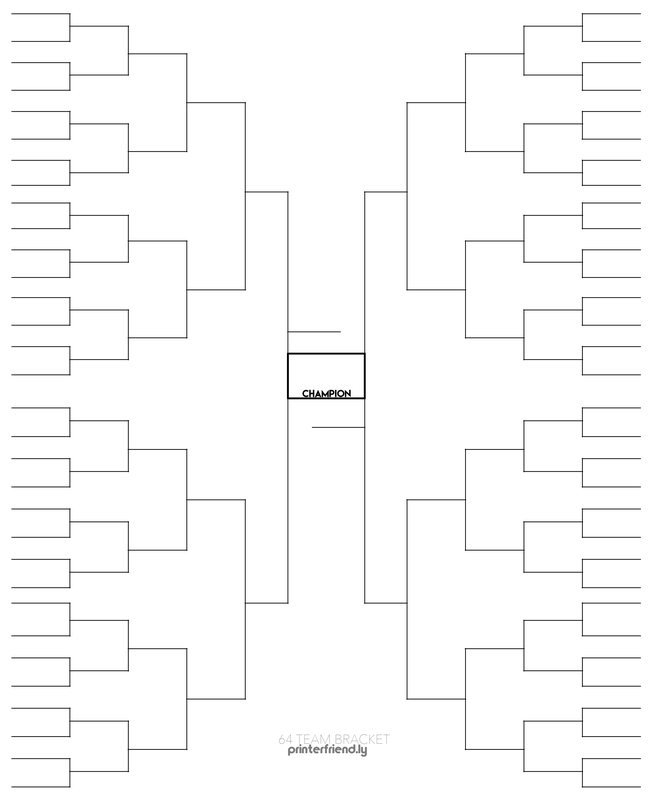 Do you have a 64-team tournament coming up and need a blank bracket to print out for your needs? Look no further than where you’re at right now. Whether you’re organizing your own tournament or your team is playing in the tournament itself or are just a friend or lover following the team, you’ll need a tournament bracket to keep track of the field. What is a 64-Team Bracket? Tournament brackets vary in size based on the amount of teams participating and keeping up with 64 teams in your tournament can seem daunting, but our bracket will make it easy for you! A 64 team bracket works out as evenly as a 4, 8, 16, and 32 team tourney does. In addition to an even number of teams, there are an equal number of brackets as teams advance into the following rounds, making for a trouble-free and simple to follow tournament – at least from a management standpoint. For sixty-four competing teams, there would is an perfect amount of teams to start the tournament and ideal number where every team moves into the next round with no byes or play-in games. Take a look at the single-elimination bracket sample to get a visual of what we’re talking about. You’ll see how the tournament will progress from the first round to the second round and beyond. Our single-elimination, sixty-four team downloadable brackets comes in a variety of options! You can download and print them out in PDF, full-size image (JPG) or in Excel. Download our 64 Team Printable Tournament XLSX Bracket if you want to edit and customize using a keyboard or our 64 Team Printable Tournament Bracket PrinterFriendly PDF if you’re chill with filling teams and seeds out with a pencil.